When it comes to wedding fashion, traditionally the choice for grooms has been somewhat limited to either black or grey. The Vintage Suit Hire Company is here to liberate grooms from dull, traditional options with our range of 100% wool suits to hire and purchase, along with our selection of eclectic alternative accessories. 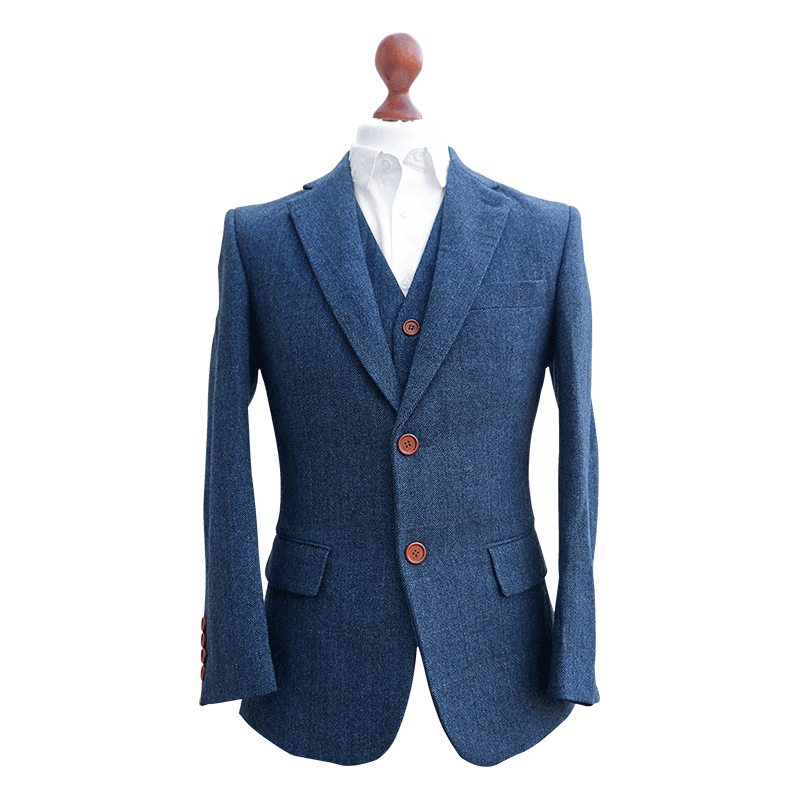 A striking blue 3-piece wool suit with contrasting brown buttons, and can be worn dressed up with a tie, or casually with a cravat or an open collar. 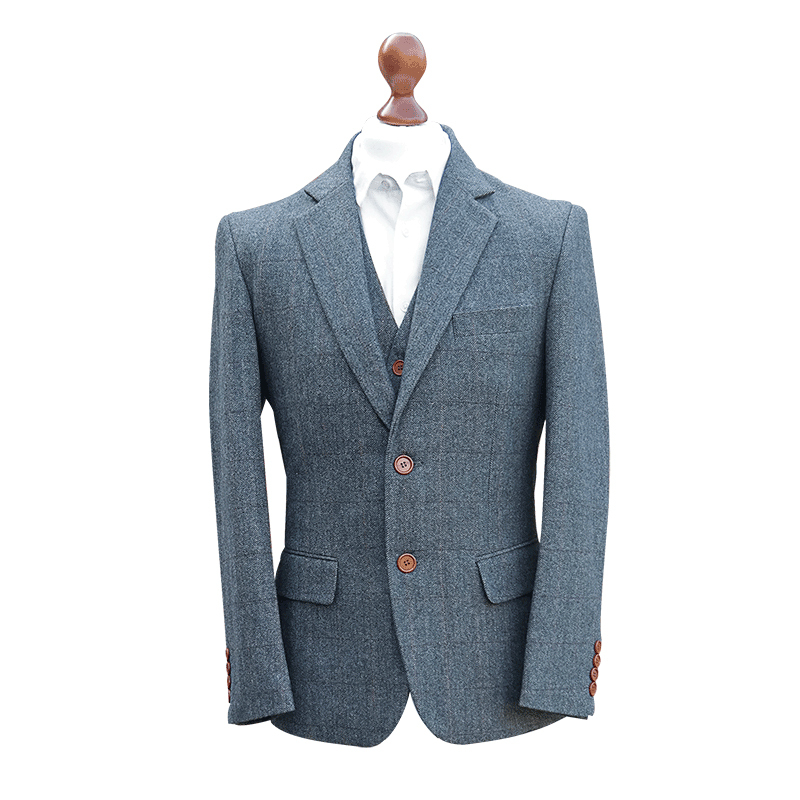 The 3-piece Burford brown is perfect for rural events and can be dressed to create the look of the landed gentry, or a more folky informal look. A grey feint herringbone pattern is a timeless, flexible style for any colour scheme, and looks great in either a muted city style or with patterned accessories and braces. The suit you get married in has great sentimental value and the quality and versatility of our designs mean that they can be worn time and time again after the big day. For this reason we give you the opportunity to own your own Vintage Suit Hire Suit. Our new alterations service runs hand in hand with our Own Your Own offering, available on each of our suit styles for those looking for something a little more individual. Picture this; the “groom” and his groomsmen wear the same suit, but the groom has his fitted in a way that suits them best. For those who would only wear the suit as a one-off for a special event, or if you have a number of groomsmen to clothe, our 3 piece hire option is perfect. You will feel like a million dollars without hurting your bank balance too much! We know you don’t want your wedding to look the same as every other one you’ve been to; that’s why you’re here. We have an awesome supplier base and, along with your suit hire or purchase, we can work with you to source a variety of accoutrements such as neckwear, pocket squares and buttonholes, as well as braces, pocket watches, all competitively priced. Living Coral - Pantone Colour of the Year – (Why) Should You Care? In the world of the discerning man’s wardrobe and wedding attire, how will Living Coral be revolutionising your life or at least your wedding? Well that’s another year done and time for us to sit back and take stock at what a fantastic year we have had. Now that Christmas is upon us, we’ve hand-picked our top gift ideas to suit each budget, and here they are..
We’re pretty chuffed to have been shortlisted as the Best New Business at The SME National Business Awards, and we’ve running in the Four Counties Wedding Awards for Menswear 2018. So now that we are in August, we are so chuffed to announce that we are now working in partnership with Legend Bridal Designs, and you will be able to buy or hire our worsted wool suits with them, ready for weddings in October 2018 onwards. We're pretty chuffed to have been shortlisted as the Best New Business at The SME National Business Awards. It's great to get recognition outside the wedding community, and on a national level as a fast-growing and innovative business, and as we're a small, tight-knit indie business we're so happy that our unique tweed suit hire offering has made it into the line-up. 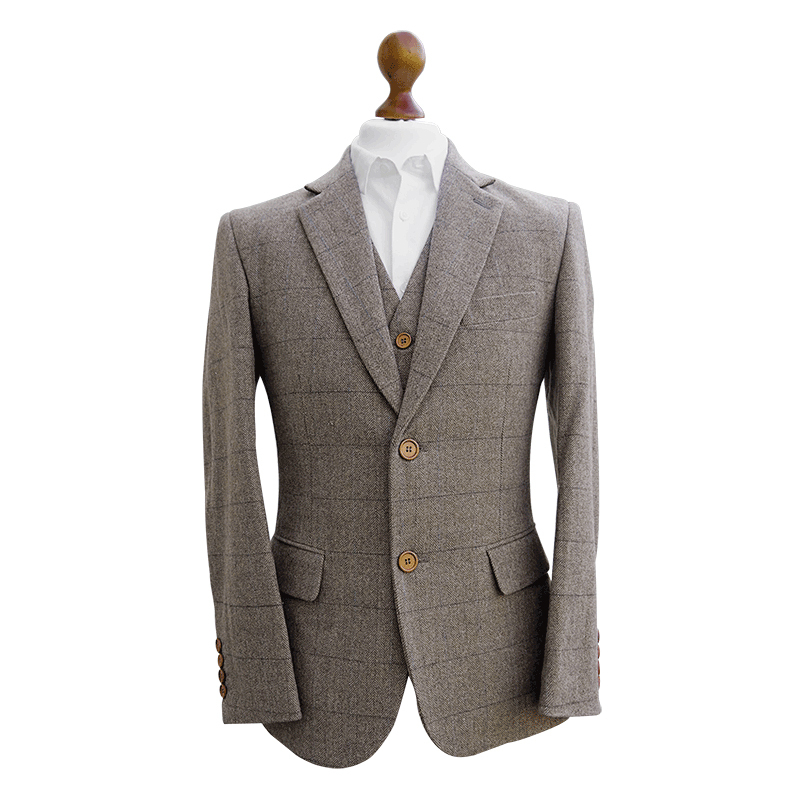 We can’t believe we are halfway through the year already; it seems to be flying by, with no chance of slowing down and we are now in peak season supplying around fourteen grooms a week with tweed suits for them and their parties for their big day.